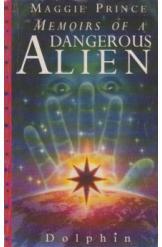 Memoirs of a Dangerous Alien by Maggie Prince, Sci Fi. Book is in good condition, all pages intact. Dominic's new neighbors turn out to be a gang of interstellar rebels who recruit him into their fight to protect Earth from the United Council of Planets. Dominic has become a dangerous alien.